Like the other 300 plus communities that Kevin Smith Transportation Group services, Boyertown, PA appreciates the engagement that only a local company can deliver, With operations based across southeastern PA including Berks, Bucks, Chester, Delaware and Montgomery Counties and the entire Philadelphia, PA area, KSTG is the obvious choice for every person and business in Boyertown, PA.
For individuals and companies based in Boyertown, PA who have a need for either Leisure or Corporate Transportation services, Kevin Smith Transportation Group is the only solution you need. KSTG’s Leisure division will often be seen sending out a Wedding Limo or Call on most weekends. Wedding Shuttles can be seen every weekend in Boyertown, PA, moving everybody from Bridal Parties to Wedding Guests, making sure everybody can celebrate safely without the worry of figuring out how they will get back to the hotel safely. If a Party Bus rental is on your list, let KSTG arrange the perfect vehicle. Looking for something more elegant like a Stretch Limo and have KSTG send one of our Luxury Limos to Boyertown, PA and pick you up. Ideas may arrange for that landmark birthday celebration to simply a bar crawl with a group of life-long friends. Whatever the need, if your night is starting or ending in Boyertown, PA, let Kevin Smith Transportation Group deliver you in style. Almost every business in Boyertown, PA will eventually have a need for professional Corporate Transportation services. It may be a one-time request for that VIP client to daily shuttle services moving employees back and forth from a regional rail station. Whatever the need, Kevin Smith Transportation Group’s fleet of Black Vehicles from Yukons to Cadillac’s are the perfect choice for those focused on Luxury and Quality. Airport Transportation is a common service request with Philadelphia International Airport (PHL) located so close to Boyertown, PA. With more than a dozen International Airports in the Mid-Atlantic area, many companies will utilize KSTG’s services for Airport Transportation to places like Newark international (EWR), Kennedy Airport (JFK) and other airports north and south of the Boyertown, PA area. Other that Kevin Smith Transportation Group offers companies in Boyertown, PA include Shuttle Services. 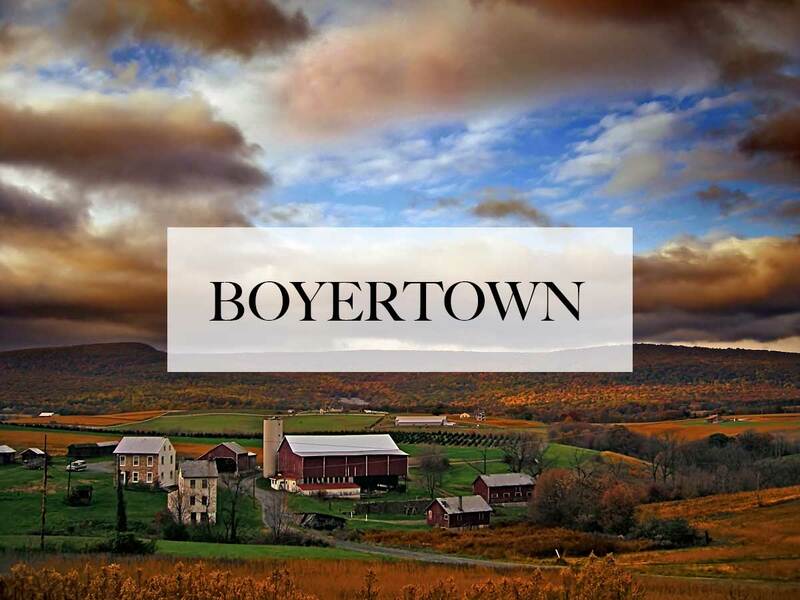 What makes companies great in Boyertown, PA is their ability to recruit the best talent. That often means recruiting in non-traditional markets. With KSTG’s Shuttle Services, many companies today have expanded their target markets to locations up and down SEPTA’s regional rail lines, providing employees with an easier commute. After a long day at work, getting a chance to relax in the back of a KSTG shuttle and being dropped off at the rail station for a traffic-free commute home is setting apart those companies in Boyertown, PA who are leveraging this employee perk. In addition, many companies in Boyertown, PA have employees or clients who will be traveling from outside the region. Whether it is Philadelphia International Airport or a local FBO like Wings Field, Northeast Regional Airport or Doylestown Airport, KSTG has a fleet of Luxury Cadillac XTS’s and Black Yukon’s to make sure your visitors are delivered on time and safely. Most companies in Boyertown, PA have begun to institute strict Duty of Care requirements around ground transportation, not allowing their employees to use any unregulated apps. This means that a company like Kevin Smith Transportation Group, with a highly skilled, licensed and screened staff of chauffeurs, becomes the perfect option for any company in Boyertown, PA who wants to offer their employees a safe and reliable transportation option. Black Car service is more than just a late model black vehicle. It is about providing a custom chauffeured experience where safety and luxury don’t have to be sacrificed. Boyertown, PA has been a key contributor to the success of Kevin Smith Transportation Group. An award winning company since its inception, KSTG delivers daily to both individuals and companies across Boyertown, PA. So whether it is that once in a lifetime event that needs to be perfect or just a routine trip to the airport, let KSTG be your total ground transportation solution. Today, KSTG is Boyertown, PA’s #1 Transportation Company and as we continue to grow, the entire team at KSTG is excited to see where that success will take us. So for those who use us regularly or just once a year, thank you for making KSTG the company it is today. Boyertown, PA is a borough in Berks County, PA. The population is estimated at 4,055. A post office called Boyertown has been in operation since 1828. The community was named for its founders, brothers Henry and Daniel Boyer. The Rhoads Opera House Fire occurred on Monday evening, January 13, 1908 in Boyertown, Pennsylvania. The opera house caught fire during a stage play sponsored by nearby St. John’s Lutheran Church. The fire started when a kerosene lamp being used for stage lighting was knocked over starting a fire on the stage. In short order the spreading fire ignited a mixture of lighting gas & oxygen from a malfunctioning stereopticon machine being used to present a magic lantern show at intermission. Audience members waited for the fire to be extinguished by theatre personnel, wasting the precious minutes they needed to escape safely. The stage and auditorium were located on the 2nd floor and the few emergency exits available were either unmarked or blocked. Two fire escapes were available but were only accessible through latched windows whose sills were located 3 & 1/2 feet above the floor. Of the approximately 400 men, women, and children either in attendance or associated with the performance of the play 171 perished in various ways as they tried to escape the conflagration. In the panic to escape many were crushed in the narrow main entrance stairway as well as against the main exit swinging doors of the 2nd floor auditorium. In a few instances entire families were wiped out. One firefighter John Graver, was also killed while responding to the incident. The “Rhoads Opera House” was not a structure normally described as an opera house. It was a three story commercial brick building which contained a hardware store and bank on its first floor, an auditorium (the “opera house”) and offices on its second floor, and several meeting rooms and offices on its third floor. The auditorium was a rental facility made available for public and private events such as business meetings, lectures, school graduations and public entertainment events. The auditorium included a small stage located at the back end of the auditorium. It is doubtful that any opera was ever performed on this stage. The present day building occupying the same site as the original Rhoads Building on the corner of Washington Street and Philadelphia Avenue is somewhat similar in overall appearance to the original Rhoads Building. The main difference is in the overall height of the building and its second floor windows. In the new building these are approximately six feet tall, in the original building they were closer to eight feet tall. The original auditorium was approximately 12 feet in height thus accommodating the taller windows. The present day building does not house an auditorium at all, the second floor is consequentially of a lesser height as are its windows. Additionally, the present day building is not equipped with fire escapes. The original building had three: one on its front facade, one on the Washington Street facade, and one on the opposite side facade. In many other major characteristics the present day building is similar to the original except for certain architectural and decorative details. The present day building was constructed approximately two years after the tragic fire using fire insurance proceeds the building’s owner and prominent Boyertown citizen, Dr. Thomas Rhoads, received as a result of the complete destruction of the original building.